Keurig has produced another set of top quality single-serve brewing systems with the 2.0 series. These models offer a blend of reliability, performance and an elegant design that is ideal for any home or office setting. If you are looking for a simple yet capable single-serve brewing system, then the K200 and K250 models are worth looking into. This article will review each model, revealing their similarities as well as their differences. After reading this you will know which model is best suited for your particular needs and you will find out more about the differences between coffee machines Keurig K200 vs K250. You can see that these two Keurig’s models are quite identical and major difference between them is water filter. Let’s go and read full review. 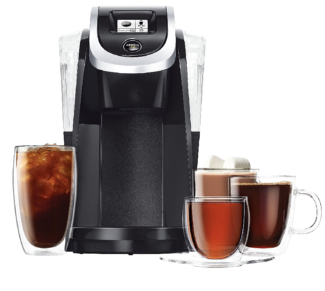 The Keurig K200 is a compact and elegant single serve brewing system, ideal for any home or office setting. The 40 oz water reservoir is ideal for small group environments, allowing for multiple beverages to be brewed before needing to be refilled. Additionally, the water level is clearly visible from the front of the machine, so you will always know how much water you have at any given time. Choose from any of 9 different brewing sizes to get the perfect beverage each and every time. Eight sizes allow you to customize your individual beverage, while the ninth size lets you brew a full carafe of coffee, perfect for small group meetings at the office. An easy to read monochrome display makes programming quick and easy. You will be prompted through each setting, enabling you to customize your beverage to your precise taste. As well as being able to choose the size of your drink, brew strength settings even allow you to choose the strength of your drink. The drip tray is easily removable, allowing for quick and easy cleaning when more than a wipe with a cloth is needed. Additionally, removing the drip tray will allow you to place a larger cup under the brew spout, providing even more versatility and convenience. A customer rating attests to the performance and reliability of this model. 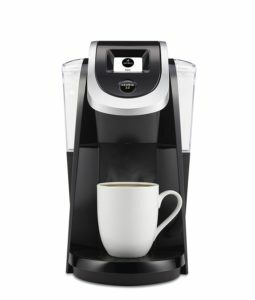 If you are looking for a simple yet feature rich single-serve brewing system, you can’t go wrong with the Keurig K200. The Keurig K250 single-serve brewing system is the improved version of the K200. Offering many of the same features as the K200, it is hard to tell the difference between the two at first glance. There are, however, enough additions to justify the difference in price. The K250 comes equipped with the same 40 oz water reservoir, allowing for multiple beverages to be brewed before needing additional water to be added. Again, this makes this model ideal for any home or small office setting. You can choose from the same 9 brew size settings as the K200, including the carafe size. This versatility makes the K250 a perfect choice for entertaining small groups, such as office meetings or small get-togethers with friends at home. A 2 inch monochrome screen makes programming and operating the K250 quick and easy. The interface will prompt you through all of the choices you can make regarding your beverage. This simplifies the brewing process by eliminating numerous buttons that can make programming complicated and unpleasant. Brew strength control settings allow you to choose how strong your beverage is. This means you have control over virtually every aspect of each beverage you brew with this system, just as with the K200 model. The drip tray is easily removable, making cleanup quick and easy. This also allows you to brew directly into your favorite cup or mug, adding an extra touch of personalization to your beverage. Water quality is a focus of the K250. As a result, the K250 is equipped with a water filtration system. A convenient filter handle as well as two water filters are included with the K250, making it a step above the K200 which lacks water filtration. A bottle of Keurig Descaling Solution is also included with the K250, allowing you to thoroughly clean the system of any mineral deposits which can build up over time. Four K-Cup samples are also included, allowing you to start brewing right away! A good customer rating means that this model has been as well received overall. This makes the K250 a good overall choice for anyone looking for a simple yet reliable single-serve brewing system. If you buy, know that you’re save little money if you decide to buy K200. And this Keurig coffee maker is really good value for money. All in all, you really can’t go wrong with the K200 or the K250. Each provides an elegant and compact single-serve brewing system that is both reliable and versatile. 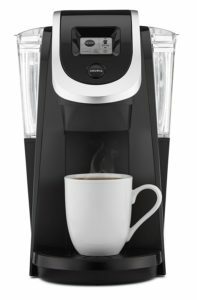 The main difference between K200 and K250 is that the Keurig K250 comes complete with a water filtration system and descaling solution. This is not necessary if you live in a more rural area that has a softer water supply. However, if you live in an urban environment where the water is hard and mineral heavy, then the extras in the K250 make that the model best suited for your particular needs. If you want tu buy a Keurig 2.0 coffee machine which will easily fit into your budget then these two models are ideal for you. These are the cheapest versions of Keurig 2.0 and and I’m really happy with my K250. If you are not a coffee addict and if you do not have a need for a very large water reservoir buying Keurig K200 or K250 would be smart move.